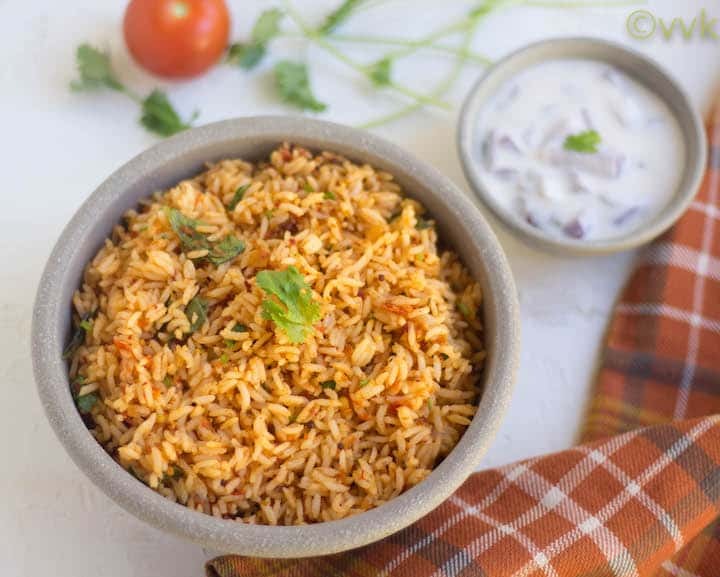 Tomato rice is one of the favorite lunch box recipes, and there are many ways to prepare this recipe. 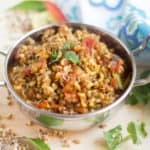 You can make this with garam masala and mint more like tomato biryani or without mint more like tomato pulav. And here is a unique version that doesn’t need any garam masala or the biryani spices like cardamom, cloves, cinnamon, fennel seeds, etc. 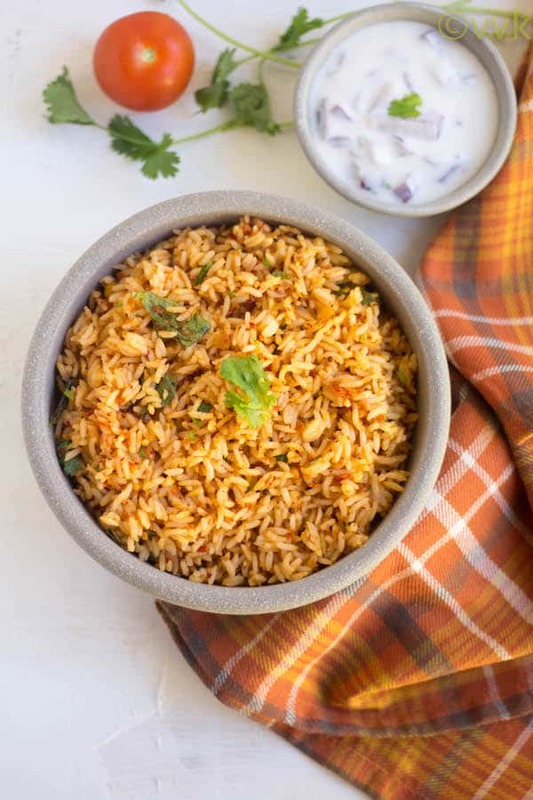 All you need for this recipe is – tomatoes, shallots, red chilies, cumin seeds, rice and the regular tempering spices. 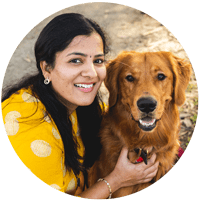 I learned this recipe from my aunt, and this is vaandu’s favorite lunch box recipe these days. 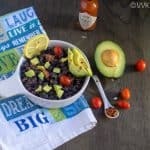 As I mentioned above, you can prepare the sauce or base for this recipe well ahead. I usually make it the day before, and in the morning I saute the sauce and mix the rice with it. So how to make the tomato rice paste? Just grind the tomatoes, shallots, red chilies, cumin seeds without any water. That’s it. Your tomato rice paste is ready. When needed, do the tempering and cook the sauce and mix the cooked rice. You can use leftover rice also for this recipe. 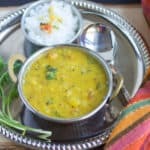 Curry leaves and channa dal for tempering adds a unique texture and flavor to this rice recipe. Cook the rice in your preferred way by adding two cups of water and allow it to cool. Grind the tomatoes, small onion, red chilies and cumin seeds into a smooth paste. Add mustard seeds, urad dal, channa dal, and hing. When they splutter add curry leaves. Now add the ground paste, turmeric powder, and salt. Cook the paste until all the moisture is absorbed. It takes about five to seven minutes. Then turn off the heat. Now add rice and mix it well. That’s it. Tomato Rice is ready. 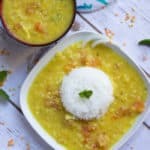 Serve it with raita or potato curry. I use Roma tomatoes, and they are not tangy. But if you use other tangy varieties, please adjust the salt and chilies accordingly. 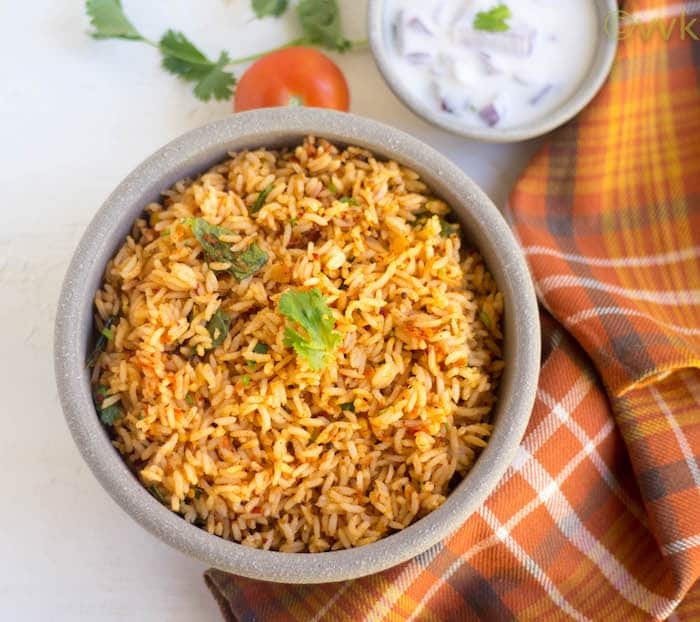 You can use any rice for this tomato rice. Please try not to skip curry leaves and channa dal. 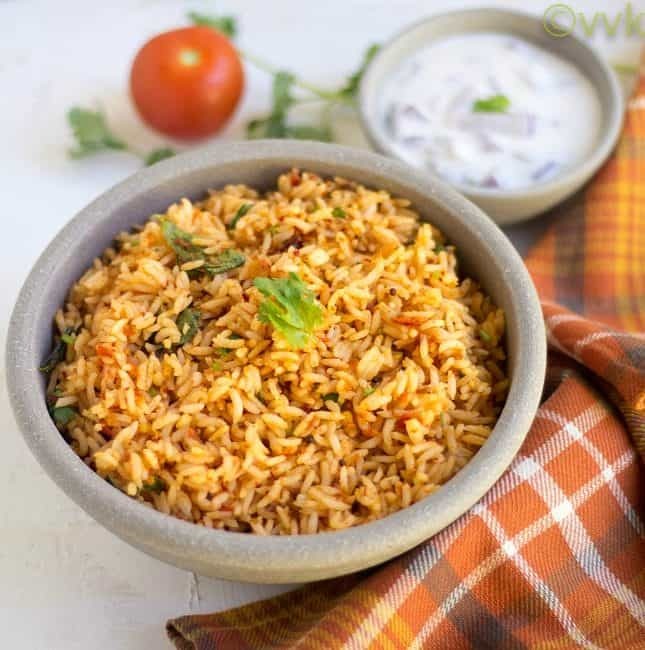 Tomato rice recipe with the flavors of cumin seeds but without any garam masala. A perfect kid's friendly lunch box recipe with fresh tomatoes & minimal spices. That's it. Tomato Rice is ready. 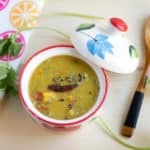 Serve it with raita or potato curry. I used Roma tomatoes, and they are not tangy. But if you use other tangy varieties, please adjust the salt and chilies accordingly.